Creating the Perfect Cheese Board | We Like to Cook! 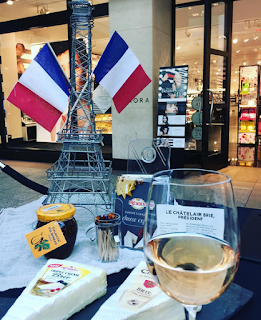 An afternoon spent sampling a selection of French cheeses at the Cheeses of Europe Pop-up recently held at Lenox Square Mall reminded us of the pure joy that is cheese. We sampled a variety of cheeses including Camembert, Abbaye Ste-Mere, St. Andre triple cream and enjoyed some amazing appetizers with cheese from Dogwood Catering including roasted pears with St. Agur bleu cheese and toasted pecans, grilled peaches with Mimolette and prosciutto, and crostini topped with fig preserves, brie and rosemary. 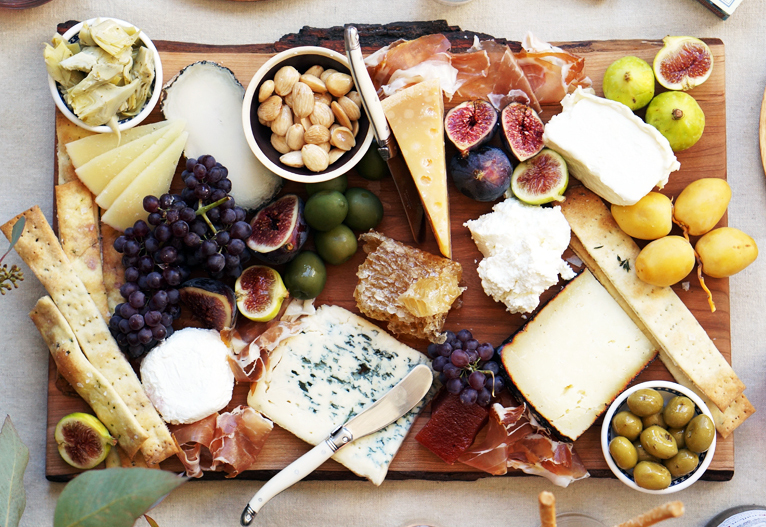 We were inspired to share our favorite tips for crafting an impressive and delicious cheese platter. Fresh cheese that's moist, creamy, and mild including Boursin, Chèvre or Humboldt Fog. Bloomy-rind cheese that's buttery, mushroomy, and decadent like Camembert, Saint Albray, or Brie. Semisoft cheese that's pliable, mellow, and earthy such as Comté, Abbaye Ste-Mere or Fontina. Blue cheese that's dense and pungent like Bleu, Roquefort or Gorgonzola. If you are serving the cheese as an appetizer, plan on 2 to 3 ounces of each cheese per person. For an after-dinner course, plan on 1 to 1½ ounces per person. Serve cheese at room temperature for ideal flavor. Take cheeses out of the refrigerator and let them sit at room temperature for at least 45 minutes before serving. This brings out those lovely nuances of flavor and aroma. Don't crowd the cheeses on the platter. If you are presenting the cheese in whole blocks or wedges, leave room around each cheese so that it can be cut easily. Also think about letting guests slice their own semi-hard cheese vs pre-slicing it, as cheese slices can dry out around the edges if left to sit for too long. Hard cheeses like parmesan are ok to crumble a bit to show guests how to enjoy it. Separate the strong-flavored or strong smelling cheese from the milder ones on the platter. Label each type of cheese and offer a separate knife for each. Labeling cheeses is a good idea, especially for your more cautious guests! Reusable cheese markers are handy, as are small cards. China markers or dry erase markers are wonderful on erasable surfaces, and chalk boards are also popular for good reason: they’re cute and customizable. Serve cheese with baguette slices or crackers and choose mild or neutral flavored crackers that will not overwhelm or alter the flavors of the cheeses. 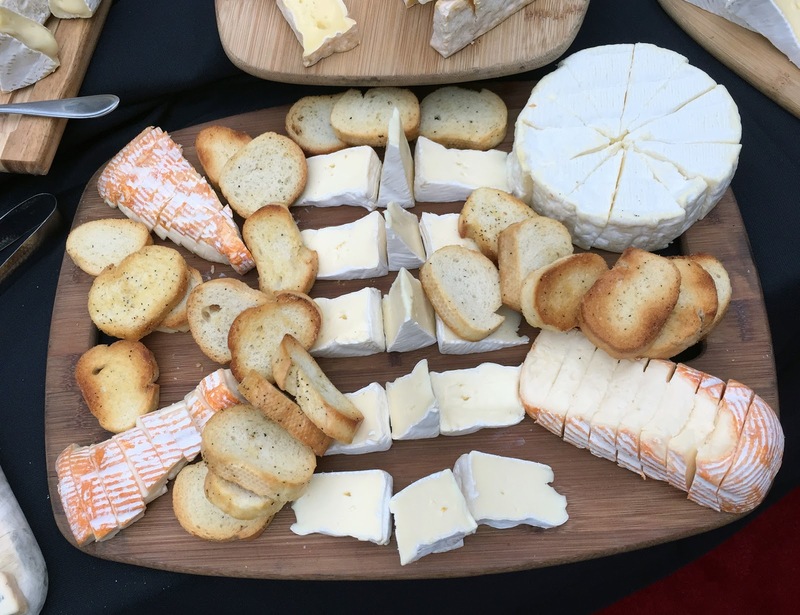 Be mindful of guests who may be restricted from eating gluten by offering gluten-free crackers. Don't let the cheese stand alone. Select two or three add-ons with contrasting flavors and textures. Follow the "what grows together, goes together" rule. Serving a Manchego? Add some Marcona almonds and Manzanilla olives. A nice selection of charcuterie always complements a cheese board; a haphazard pile of prosciutto, some slices of salami or a ramekin of rillettes would all be welcome additions. Below are some general guidelines for accessorizing various types of cheeses although toasted nuts, dried fruit and honey complement most cheese selections. 1. Fresh cheeses are complemented by honey, fresh berries, radishes and slices of prosciutto. 2. Bloomy-rind cheeses match well with onion marmalade, tomato jam and toasted nuts. 3. Semisoft cheeses should be paired with mustard, pickles and fig preserves. 4. Hard cheeses deserve bold condiments like chutneys, balsamic vinegar, salami and dark chocolate. 5. Blue cheeses pair well with walnuts, crisp apple slices and olives. Be creative when it comes to serving pieces. Use a cutting board, a large ceramic platter, cake stand, a collection of antique plates, a metal or wooden tray, or a piece of marble. A slate tile from your local hardware store along with a piece of chalk make an impressive yet inexpensive hostess gift! The most inviting cheese boards have casually-arranged ingredients on a clean surface. You don’t have to put all the fruit in one corner and all the meats in another corner either. Separate items to fill in the cracks, and to make sure everyone can get a little bit of everything no matter where they’re standing around the board. Most importantly, keep it to your liking and don’t stress. Be as adventurous or as tame as you like and trust your instincts when assembling your board. If you create a selection that you will enjoy, undoubtedly so will your guests!